3 Bedroom Lodge, 1 Bathroom with woodland Views set in its own grounds. The Lodge is Self Catering, which consists of 3 bedrooms, a Double room, a single room and a twin room. The lodge has its own bathroom with walk in shower adequate for wheelchair users. The Kitchen has most utensils and crockery, fridge freezer, microwave and toaster, ample room in the lounge with a 3 seater and 2 seater sofas and a round table to seat 5 people. The lodge has free wi-fi, T.V. with DVD player and freeview channels, all bedding is supplied along with shower and hand towels. There is an Electric meter in the lodge which requires either £1 or £2 pound coins. To the outside is a veranda, steps to the front and ramp to the side, there is also a BBQ area opposite the lodge. I have owned the property since 1995, buying out my previous business partner in 2008. My wife and I are slowly building the business to eventually have six lodges, we currently have three. We continue every year to make small improvements, and see regular guests returning after their first visit to us, we do not increase prices for special occasions, the cost is the same for every month of the year. I imported the Lodge from Finland in 2004, one of 3 I purchased, the lodge is 100mm thick, which keeps it cool in the summer and warm in the winter. the lodge has 3 bedrooms based on a family of 5, there is a cot and highchair available. We are close to many activities centres whether a child/ youth or adult. 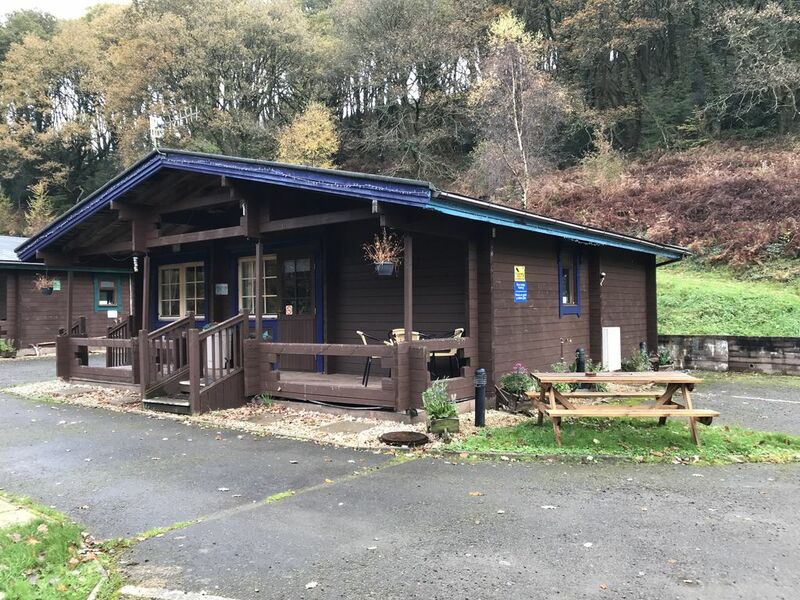 The lodge is set in 6 acres of private wooded hillside, beautiful views of the countrside, ideal for a base in exploring South Wales and the surrounding areas. We also have our own laundry room ideal for travellers staying for longer periods. There is free wi-fi, DVD players and Freeview TV, and a BBQ outside the lodge. Beds are changed when guests require. Tumble dryer available, there is a coin meter in place. Towels are provided and changed when guests require them to. The Kitchen has most utensils and crockery. There is a round table which seats up to 5 persons. The lodge was comfortable and well equipped. Dafydd was so helpful.We really enjoyed our stay and the view was amazing.We will recommend this lodge to our friends and we will be back soon. Lodge was well equipped and very comfortable for our stay. We also found Daffyd very helpful. The experience was outstanding from the minute we booked. Dafydd responds to emails very quickly and was so helpful. The lodge itself was amazing, much bigger than it looks in the photos and plenty big enough for 6 of us and a dog! We spent Christmas Eve, Christmas Day and Boxing Day here and didn't want to come home. The view outside was so Christmassy and the lodge was decorated with a tree and some other bits which was lovely. We had an unexpected welcome gift of prosecco, bucks fizz, biscuits and a Christmas card which was a really personal touch! The beds were super compfy and everything you could possibly need in the kitchen to cook a roast dinner was there. We highly recommend these lodges. Lisa and Willy. First time in wales and this lodge was like home from home, has everything you need to be comfortable and a great location for exploring. Pets are welcome, there are many rural walks in the surrounding area.